To meet the challenge of climate change, countries need significant financial resources to implement projects and programs that increase climate resilience and provide low-emission solutions for development priorities. For developing countries, this can be particularly complex. On the one hand, international support is starting to flow, although much more is needed. On the other, countries need to ensure that climate spending is based on national priorities and is directed towards the most impactful programs. For these reasons, a growing number of countries are establishing and operationalizing national climate funds. These funds enable countries to mobilize, pool and blend both domestic and external sources of finance, to support more coordinated programming of resources across stakeholders, and—most importantly—to ensure national ownership of climate finance. Africa Climate Week, hosted in Accra, Ghana, gave NDC Partnership member countries the opportunity to come together to discuss solutions to climate change, sustainable development, and NDC implementation. 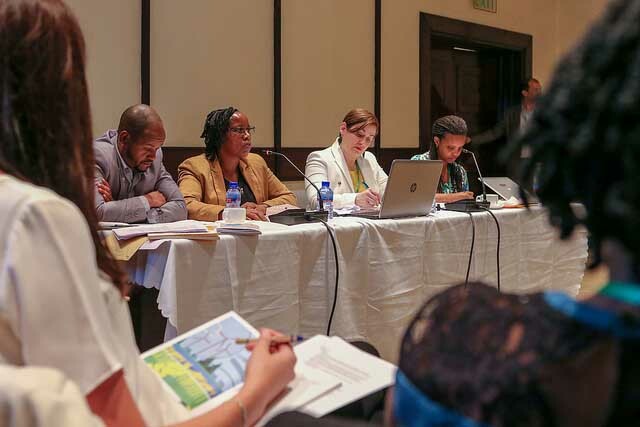 On the sidelines of Africa Climate Week, Rwanda and Ethiopia hosted a peer-to-peer convening titled, National Climate Funds: Innovations to Pool, Blend, Program and Disburse Climate Finance, supported by the NDC Partnership. In Ethiopia and Rwanda, we recognize the ever-present threat of climate change on our environment and our communities. We also recognize the economic potential of climate-smart development across sectors including agriculture, energy, and transport. That’s why our countries have taken bold, concrete steps to put climate action at the top of our national agendas, starting with developing a clear vision of economic and climate strategies. In Rwanda, our Green Growth and Climate Resilience Strategy sets out an ambitious vision to become a low-carbon and climate-resilient economy by 2050, building on Rwanda’s Vision 2020. In Ethiopia, our Climate-Resilient Green Economy Strategy outlines a pathway for achieving carbon-neutral and climate-resilient middle-income status while developing a green economy by 2025, including through climate-smart agriculture, renewable energy, and green industrialization. To help implement these strategies, Rwanda established the Rwanda Green Fund (FONERWA) and Ethiopia developed its Climate Resilient Green Economy Facility (CRGE Facility). Since the founding of both about seven years ago, we have acquired significant experience and learning on how to establish, capitalize and operationalize a national climate fund, with positive results. National climate funds have been fundamental to our progress in green development, enabling funding for climate projects that might not otherwise be able to access finance. In Rwanda, FONERWA has raised nearly US$ 176 million to date. This has come from international sources, including from the United Kingdom’s Department for International Development or DFID, KfW Group, Green Climate Fund, World Bank and African Development Bank, as well as from domestic sources, including contributions from the Rwandan government, and environmental fines and fees, like forestry and water usage fees. As a result, FONERWA has been able to support 38 climate mitigation and adaptation projects in the public and private sectors, and through non-governmental organizations. To date, our funding has created over 130,000 green jobs, improved nearly 60,000 households’ access to oﬀ-grid clean energy, protected approximately 20,0000 hectares of land against erosion, and much more. In Ethiopia, the CRGE Facility has mobilized almost US$ 200 million from international partners (DFID, Adaptation Fund, Green Climate Fund, Norway, Austria, and Denmark). Projects funded by the Facility focus on agriculture, forests, urban development and housing, transport, livestock institutional strengthening, and adaptation. Our National Climate Funds also play an important coordination role. The CRGE Facility is a single entity for stakeholders to determine how to finance and streamline implementation for CRGE projects. Similarly, FONERWA brings together many sectors and stakeholders in decision-making, under the joint oversight of Rwanda’s Ministry of Environment and Ministry of Finance. At the NDC Partnership peer-to-peer convening, we were able to share with over a dozen other countries, national climate fund lessons and insights on enabling conditions for successful fund establishment and management. Climate fund and multilateral development bank partners were also able to convey some key national fund design and implementation challenges. Countries identified various challenges, including the fundamental problem of insufficient climate financing to reach NDC targets and Paris Agreement goals; limited private sector engagement in climate projects; the lack of multisectoral coordination needed for more aligned and impactful climate action; maintaining political will to implement climate mitigation and adaptation projects; governance issues such as limited independence in the management of funds; the need for more stakeholder engagement; and the need to explore innovative revenue and financing modalities. Additional challenges mentioned were capturing and communicating climate impact to support government buy-in and to attract donor and private investment; keeping the green economy and climate change relevant in context of wider development challenges and humanitarian crises; and balancing short term and long-term needs and linking this to tangible impact. Some enabling factors for developing national climate funds discussed include the development of legislation for establishing a national climate fund; policy and regulatory frameworks that clearly outline institutional arrangements and specific roles and responsibilities across sectors and ministries; the use of national funds to leverage donor and private climate financing; and the importance of linking funds with national action plans, strategies, and assistance frameworks. Finally, working with the NDC Partnership and other international stakeholders has also helped us to map out ways to mobilize climate finance, including accreditation, capitalization, development assistance and blended finance. Climate Change is too big of an issue for any country to tackle alone. We share this world, and we share the responsibility to take care of it. In the establishment of national climate funds, as in any other initiative for climate action, we will be most successful if we work together and learn from each other. Looking ahead, the African countries gathered at this peer convening are eager to continue the dialogue on climate funds and climate financing. The NDC Partnership plans to capture the key points of learning on successes and challenges discussed at the meeting, share this more widely across the Partnership and connect countries with the knowledge resources then need to arrive at more creative solutions. Only by working together can we tackle these global climate challenges. This blog was written by Ms. Josephine Uwababyeyi, Finance Management Director of the Rwanda Green Fund (FONERWA), and Mr. Mohammed Andoshe Feynet, Director of the Climate Change Planning Implementation and Coordination Directorate within the Ministry of Environment, Forest and Climate Change in Ethiopia.